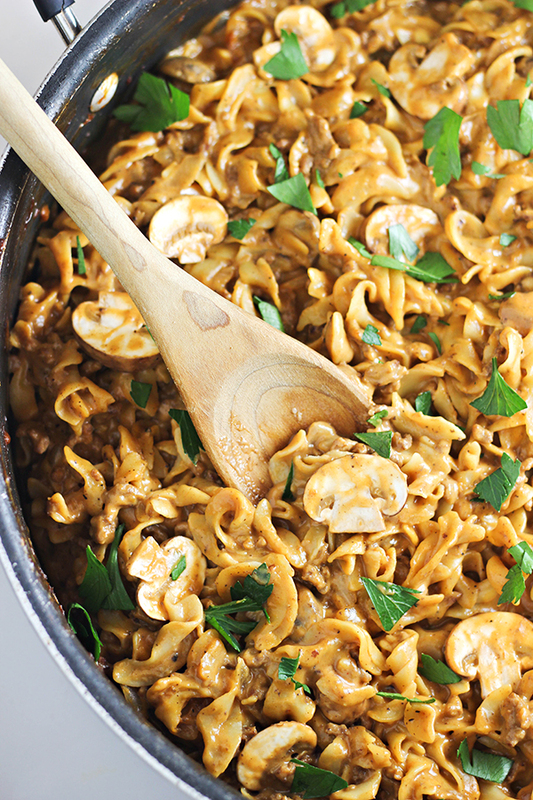 This Easy One-Pan Beef Stroganoff recipe is your answer when you want to feed your family a delicious homemade dinner, but need to get out of the kitchen fast! For the last 24 years of being a wife and mom, I’ve done my best to save time in the kitchen. Sure, I’ve made a lot of complicated dinners in my years but, most of the time, I’m always looking for the easiest ways to get dinner on the table. 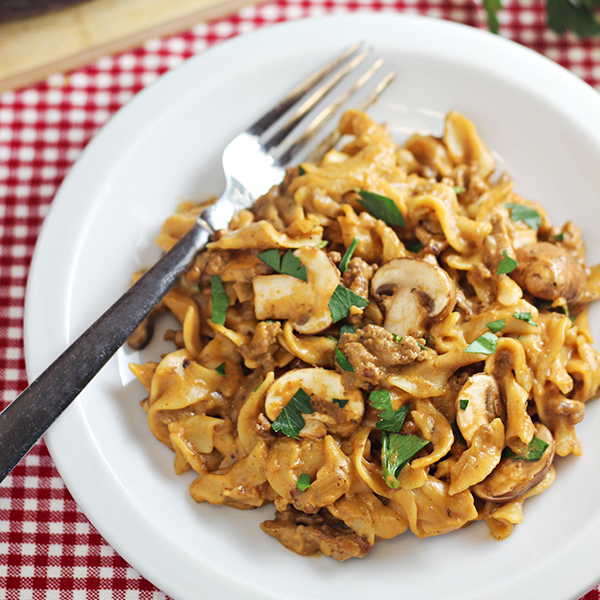 Beef Stroganoff was one of the first easy meals that I made for my family. However, the version I made years ago was quite a bit different than the one I make today. A lot of my recipes, including Beef Stroganoff, used a canned cream of “whatever” soups. I used canned soups mostly because I thought it was the best way to save time. Open them up, dump it in — it really didn’t seem like there was a way to beat that. While there are still some occasions when I use cream of “whatever” soups in my recipes (mostly old family favorites), I learned several years ago that making recipes without them often times can be just as quick. And the best part? 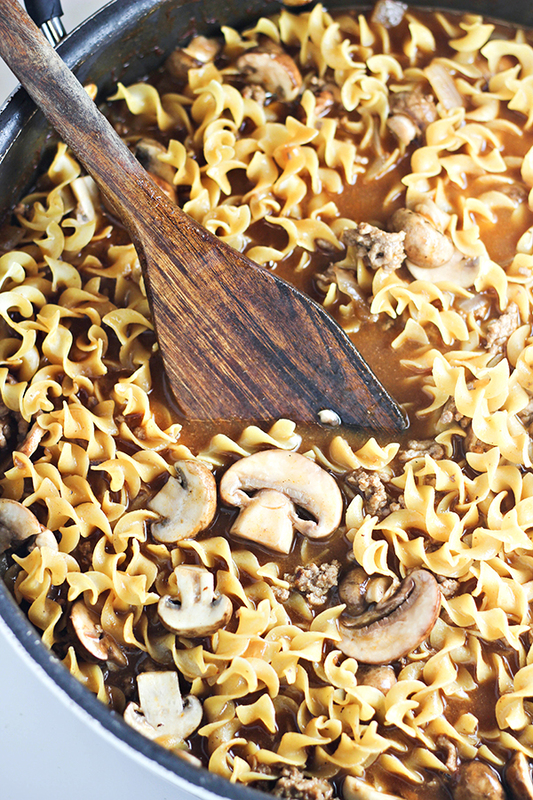 My One-Pot Beef Stroganoff is so much more delicious too. 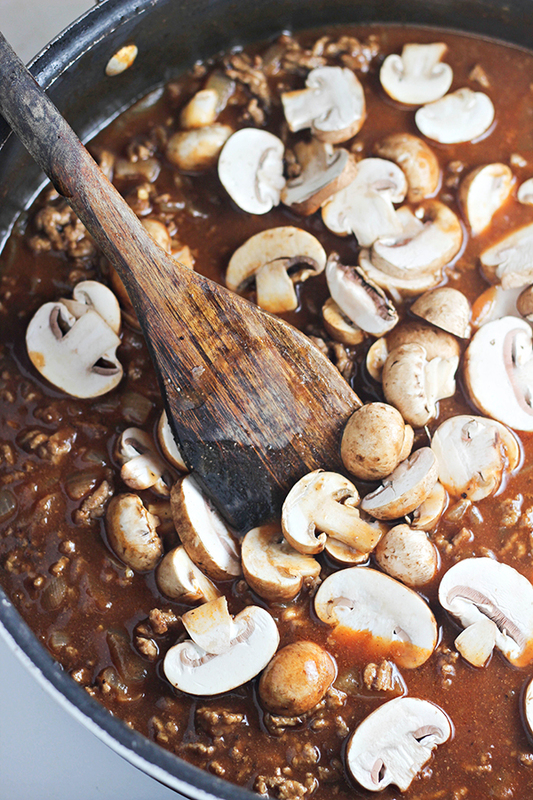 While traditional Beef Stroganoff uses thinly sliced beef, but I keep the meal easier and more frugal by using lean ground beef. 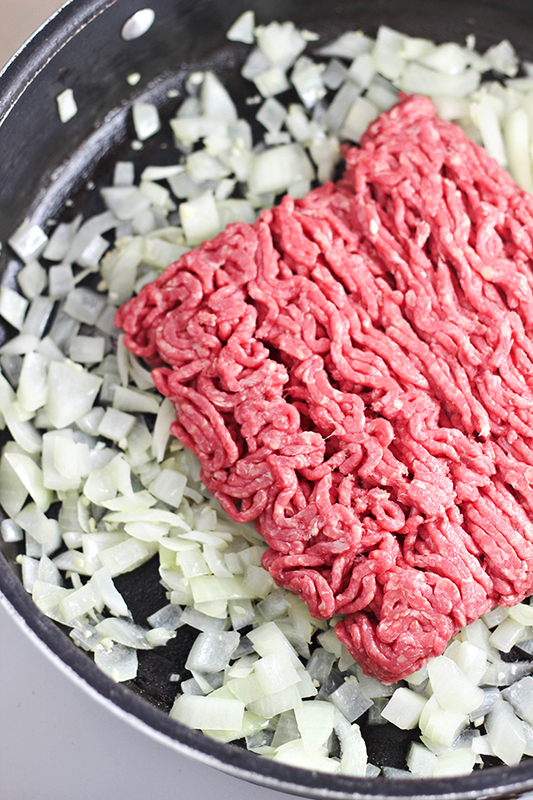 To get started, cook up a diced onion, minced garlic and a pound of ground beef. Once the beef is browned and fully cooked, you’ll add beef broth, tomato sauce, and a bit of water. The tomato sauce is something I learned from a Mark Bittman recipe that I made in 2010. Not only do I love the flavor the tomato sauce brings, but also the color. Stroganoff tends to be very brown or very grey (if using canned soup), and the tomato sauce helps to liven things up a bit. Once it does come to a boil, sliced baby bella mushrooms are gently mixed in. Last to be added is the egg noodles. They are added after the mushrooms, but while the mixture is still boiling. Carefully stir and incorporate them into the mixture, make sure nearly all the noodles have come in contact with the liquid. Once the noodles are cooked, most of the liquid will be absorbed. Remove the pot from the heat and now you are ready to stir in the sour cream. I like to divide it up in multiple dollops across the pasta so that it will combine easier. 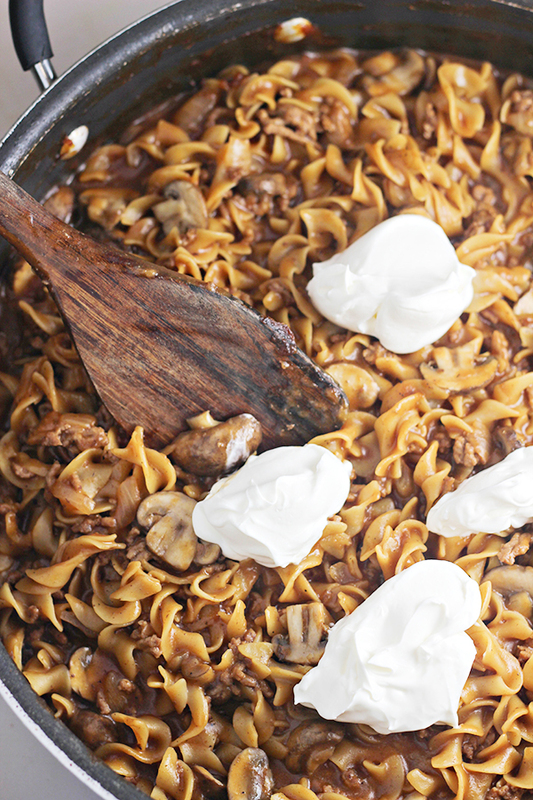 And now your one-pot Beef Stroganoff is ready and it only took about 30 minutes! To fancy things up a bit, I topped it with some chopped flat-leaf parsley, but that’s completely optional. We serve it directly from the skillet it was cooked in (you know, keeping it to that one pot to clean up), but you could also spoon it onto shallow bowl if you want it to look nicer on your dinner table. 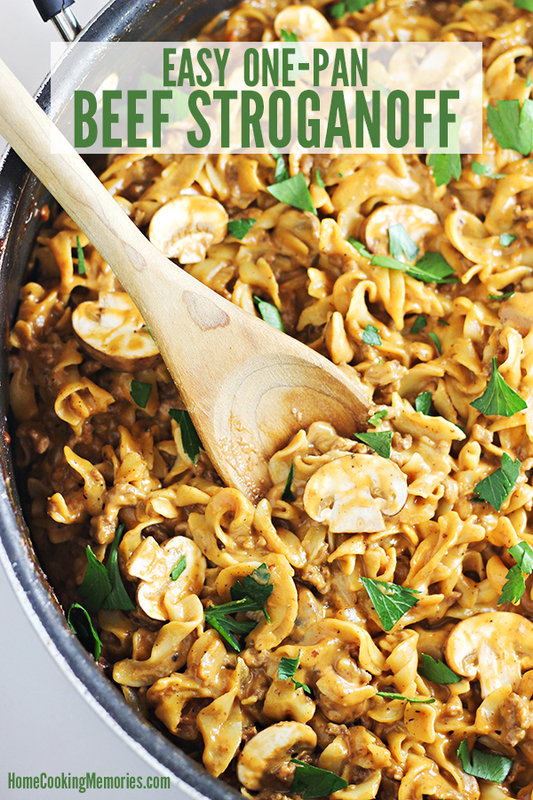 If you’ve made Beef Stroganoff before, but made it with canned soup or a boxed packaged dinner, or if it took too long to make or left you too many dishes, I recommend you try this. 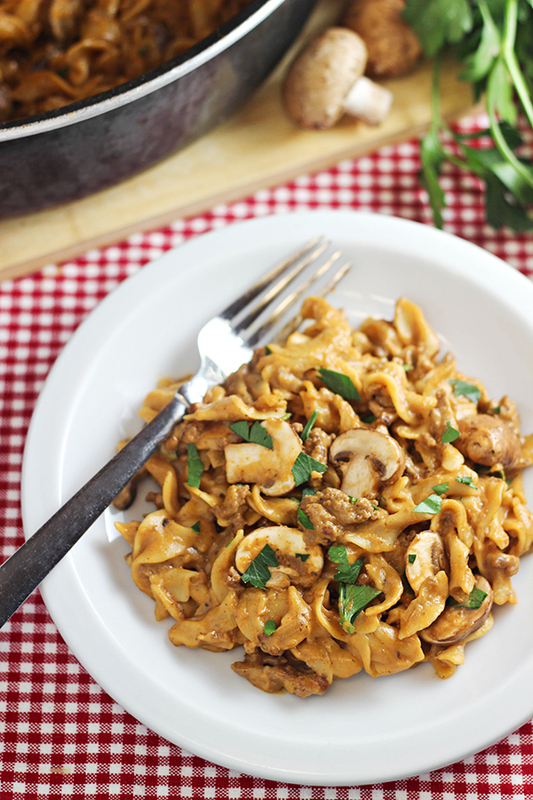 It’s delicious comfort food your family will love…and you’ll love how quick and easy it is. In a very large skillet or Dutch oven, heat olive oil over medium heat. Add onions and garlic and cook for about 1 minute. Add ground beef and cook until meat is browned and fully cooked. Sprinkle meat evenly with flour, and stir to combine. Add broth, tomato sauce, Worcestershire sauce, and water to the meat mixture. Stir to combine. Bring mixture to a boil. Add mushrooms and pasta. Stir gently to ensure all pasta has come into contact with the liquid. While stirring occasionally, allow mixture to simmer until noodles are fully cooked and most of the liquid is absorbed. Remove from heat. Stir in sour cream. Season with salt and pepper, if desired. Serve.